The openSUSE booth was well alive, thanks to Martin who made sure everything would be ready. There was a computer to try SUSE Studio, and to create some images on USB keys and it attracted a lot of people. Stickers and DVDs were of course available, and some people even got a great t-shirt! It was also good to be able to talk to Henne, Andrew, Zonker and others. Baptiste also took care of stickers, and so we had 5000 stickers to distribute. And those stickers, wow... I love them: simple and beautiful. I loved them so much that I took a good bunch of them and walked around to give them away to people I met or on other booths. Reinout and Lionel did a fantastic work organizing and manning the booth, with the help of a few other people. 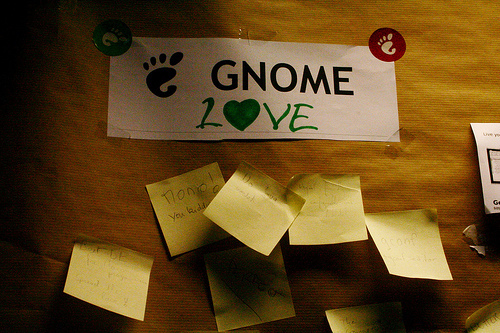 Thanks to Olivier Le Thanh, we had the GNOME Beer Event on Saturday which got a good attendance and was really a great place to be for random chats. Frédéric has the GNOME group photo in his camera, and since he loves being pinged on IRC, don't hesitate to do so and request the photo to be posted! Really good stuff. Make sure to hug all those people to thank them for their hard work! Frédéric Crozat: Did somebody asked for a GNOME group photo ? Vincent did put a lot of pressure on me and my camera, so here there are : Thanks to Anne who took those pictures. This site is licensed under the Creative Commons Attribution 2.0 License.